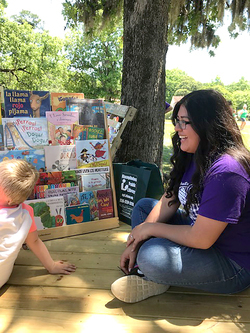 Ellie Borrego, Stephen F. Austin State University senior from Houston majoring in interdisciplinary studies with an emphasis in elementary education, helps a Día de los Libros participant select a book to read. Día de los Libros is a bilingual family event celebrating a yearlong commitment to Bookjoy - a movement encouraging families to read together. NACOGDOCHES, Texas - Stephen F. Austin State University students studying elementary education recently proved learning can happen anywhere. Seated in a new outdoor learning space called "Class in the Grass," SFA students and children from Brooks-Quinn-Jones Elementary School and their families participated in Día de los Libros, a bilingual family event celebrating a yearlong commitment to Bookjoy - a movement encouraging families to read together. Dr. Lauren Burrow, SFA associate professor of elementary education, and almost 30 of her students partnered with BQJ first-grade teachers Kelsey Watkins, SFA alumna, and Kylie Altier to bring this event to life in Nacogdoches while similar events were hosted nationwide. "It started as a Mexican holiday and was popularized in the U.S. by Mexican-American children's author Pat Mora," Burrow said. "This family-friendly event celebrated diverse cultures, promoted fun with literacy and welcomed the BQJ community to the newest learning space on their campus - Class in the Grass." This is the third year SFA students have participated. As part of their coursework, students were required to plan activities based on a previous Spanish-English poetry lesson SFA students taught at BQJ. Activities included a scavenger hunt de colores (colors), decorating luchadora (wrestler) masks, making oceans in a bottle, bowling with manzanas (apples) and family read-aloud time with books from the Nacogdoches Public Library. "For SFA students, this provided an authentic opportunity to learn more about how to incorporate diverse languages and cultures into traditional lessons while also providing them the unique opportunity to connect with the community in a non-traditional learning space," Burrow said. "Also, this helped students realize teaching should involve the whole family, and teaching often occurs outside of normal school hours." For information about programs in the James I. Perkins College of Education, visit sfasu.edu/education.